On November 5, 2016, we bought a huge lot of parts that included a titled partial 1970 T120R. 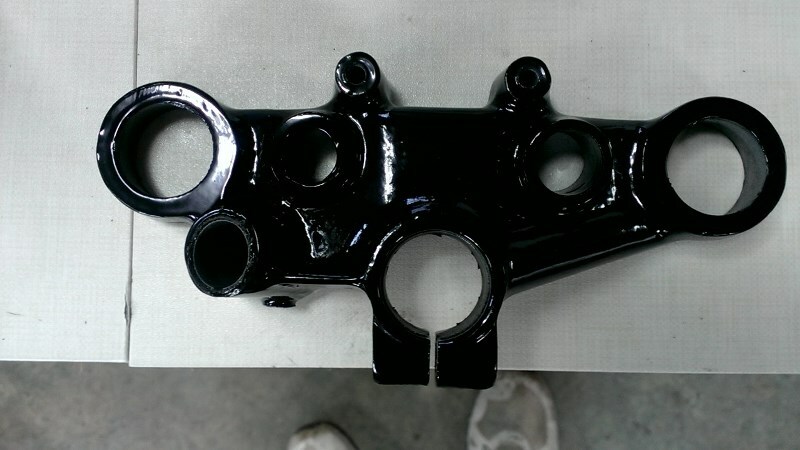 The engine was rebuilt and all black parts were powder coated. It's been sitting around the shop in the way so on March 25, 2017 I decided to at least get it on wheels so all the parts would be together and it would be easier to move. Here's how that started. March 26, 2017, the major back end parts laid out and inventoried. March 26, 2017, the major back end parts installed. 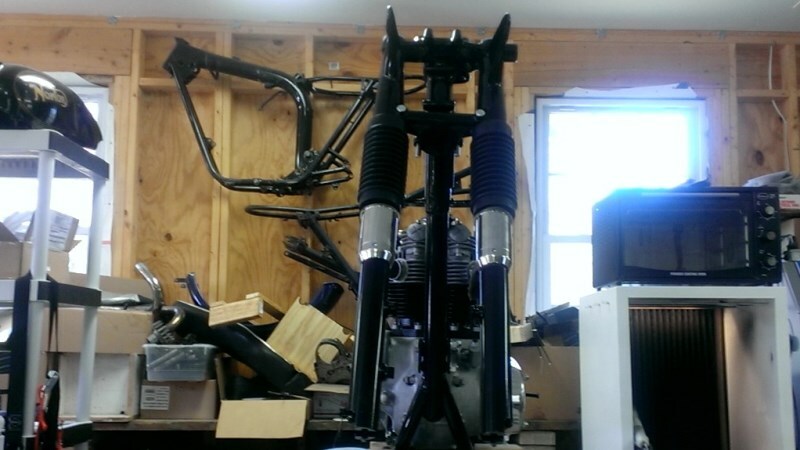 I didn't have the right mounting bolts for the rear shocks so they are ordered - just used a wrong bolt on one side to hold the swingarm up until they arrive. Once they do, the rest of the rear-end parts can be installed. March 30, 2017, It's hard to see in this picture, but the top triple tree was powder coated without masking and without removing the outer shell of one metalistic bush. Even though I was very careful, the powder coat chipped when I drove that shell out. So, the next time you see it, it will have been stripped and recoated. April 1, 2017, The backend is mostly together and I tried fenders until I found one that was the right type and fit. The colors are wrong so it will have to be painted but it's all fitted so it will be easy to install once painted. The rear wheel appeared to be ready to install but wouldn't fit between the swingarm. On investigation I realized the the brake shoes are worn out, the backing plate is warped, the bearings are no good, and the spacers are wrong! So, I have a good deal of work to do on that. April 8, 2017, The top of the triple tree has been stripped and re-powder coated, the lock is installed and the metalistic bushes are installed. The bike had races for tapered roller bearings but no bearings. Fortunately, I had a set. I had two new chrome central nuts, but both were crap. They had been chromed after the threads were cut and then slots sawn in. After hours of working on the threads, I got them one to screw on ok, only to find out the OD was too big to fit through the hole. So, I've temporarily used a steering damper-type nut. 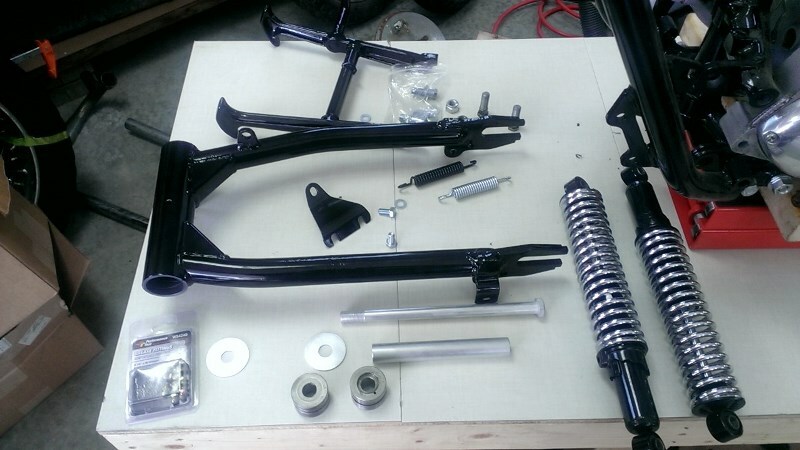 The frame had been powder coated without removing the bent steering stops. They have been replaced with new. The bike came with three fork sliders, one right and two left, all poorly powder coated. The right side and one left side were too scored inside to use. I dug though other forks I had and found a good right side. Both have been stripped, internally cleaned, sandblasted, and powder coated. The forks are assembled with all new bushings, fork tubes, springs, stainless steel seal holders, seals, washers, and gaiters. 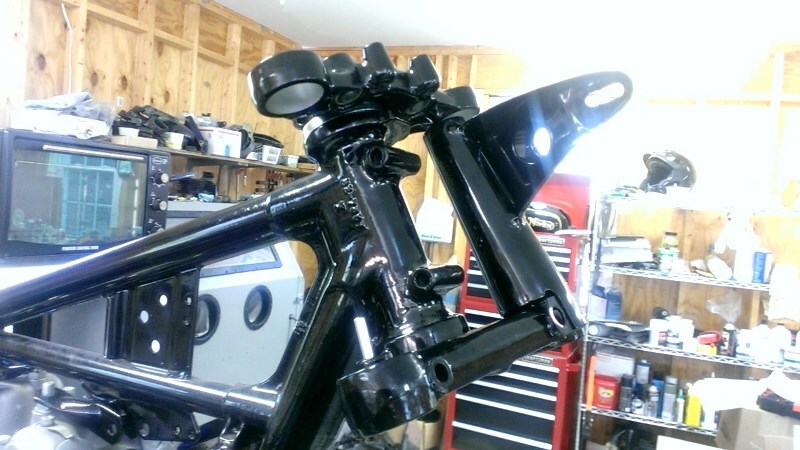 The left fork ear looked good, but the right one that came with the bike was heavily pitted before being powder coated. I sandblasted and coated another one, but ran out of time to install it and the forks. 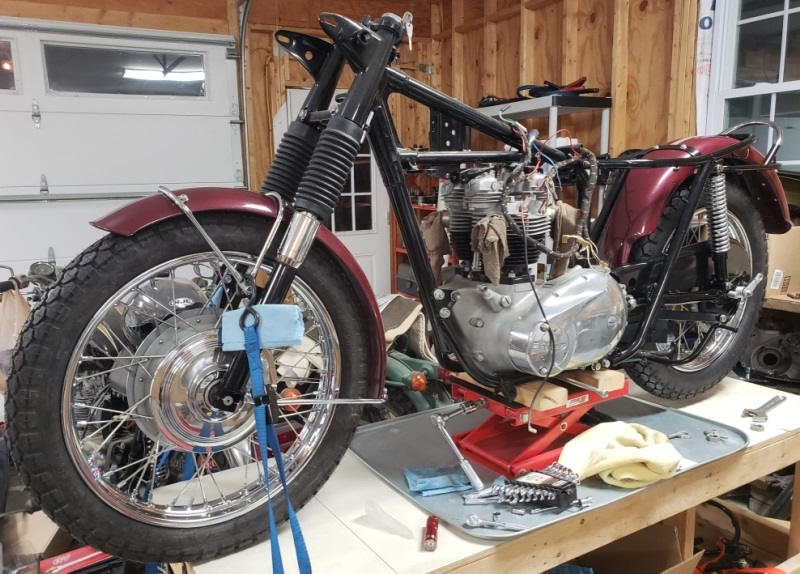 April 9, 2017, The forks are installed, time to mockup the front fender and wheel. In the background you can see the powder coat booth I made and my small oven. April 9, 2017, I tried to test fit the front wheel when I noticed that the bearings were bad and the axle was too short! The wheel has a freshly powder coated hub, a new rim and new stainless steel spokes and was supposed to be ready to install! So, I disassembled planning to just change the bearings and axle. The first picture below shows a big problem - the hub was powder coated without masking off the brake drum! 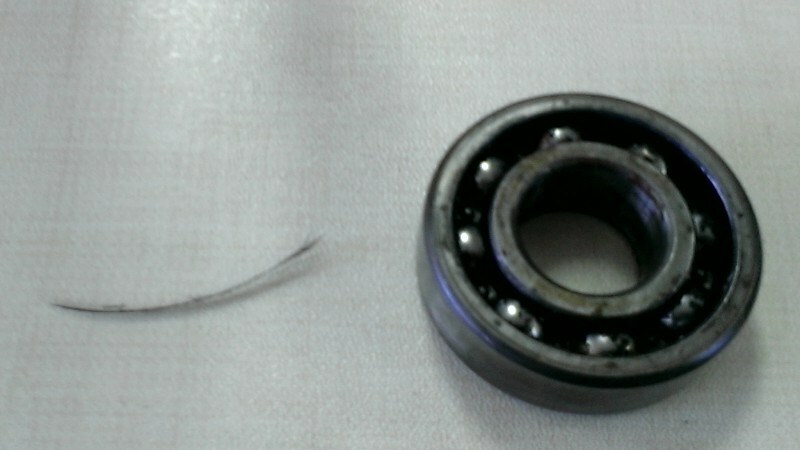 The second picture below shows the left side bearing and the piece of cable that was in the bearing! I have no idea how the wheel builder trued that wheel with a bearing that was stuck! I have around 10 front wheel axles, but none were right - fortunately, I had another wheel with the right axle. That's not all that was wrong - the brake shoes are almost down to the rivets so they have to be replaced too! 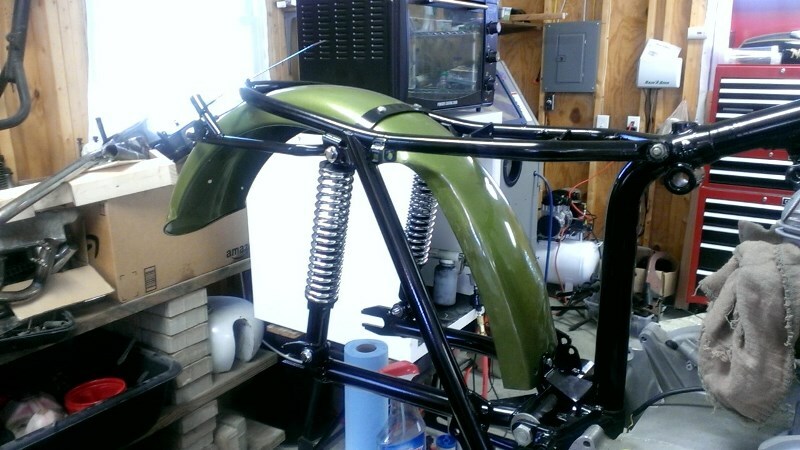 April 9, 2017, I have an original paint front fender for the bike but the bike didn't come with the stays. I have lots of stays so I went looking for a set of black ones thinking that they should be black for a 1970. I found one black (center), one terrible chrome (front), and one like-new chrome (rear) that matched the forks and fender. I figured I would powder coat them all black. That's when I realized that they should be chrome for 1970. So, I haven't decided what to do about that but I did mock it up to be sure everything fit properly. I also made sure that axle fits and sandblasted the bottom caps - still have to powder coat those. June 27, 2017 Just getting back to this bike. 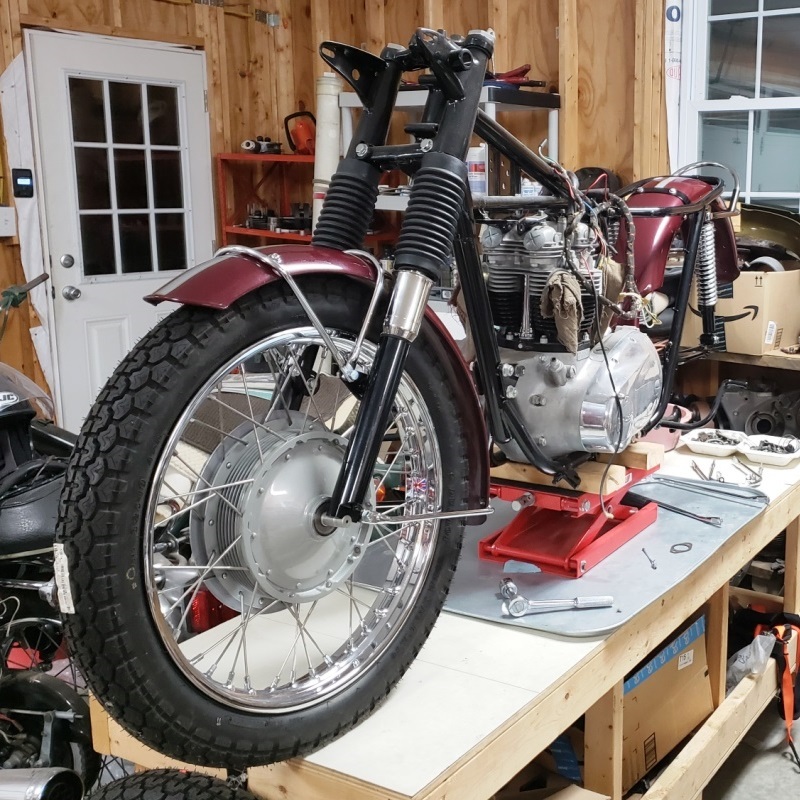 I had a "quick" fix to do on a 1969 BSA B25 for a guy that turned into a rebuild. The drive side bearing was so bad that the only thing keeping the crank from moving up and down 1/4" was the rotor in the stator! The shocking thing is that the bike ran! Several of the balls from the drive side ball bearing were laying in the sump! Then, I fell and separated my shoulder so I've been out of action for a couple of weeks over that. August 31, 2018 Over a year has gone by. Two surgeries, a broken toe and couldn't find a painter - the one I was using decide it was too much work! I finally found a painter and shipped the tank and fenders to him today. Hopefully, this will be finished this year. October 4, 2018 The tank and fenders are on their way back to me. Since the fenders are pre-fitted, I can install them and start on the wiring. I'm still trying to decide whether or not to trust the engine build or to take it apart and check it. 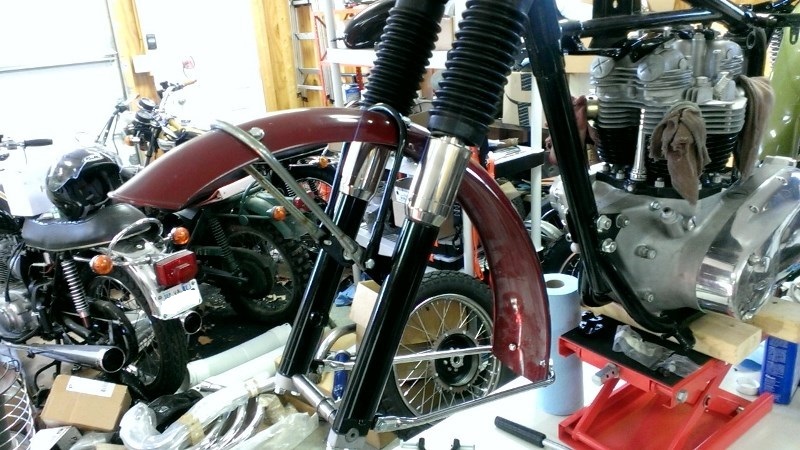 I also have to decide if I'll use black or chrome front fender stays. Chrome is correct but will cost a lot - the problem is that I have a decent rear and top chrome stays. I have lots of stays that I can powder coat. October 17, 2018 The tank and fenders are back and they are beautiful. 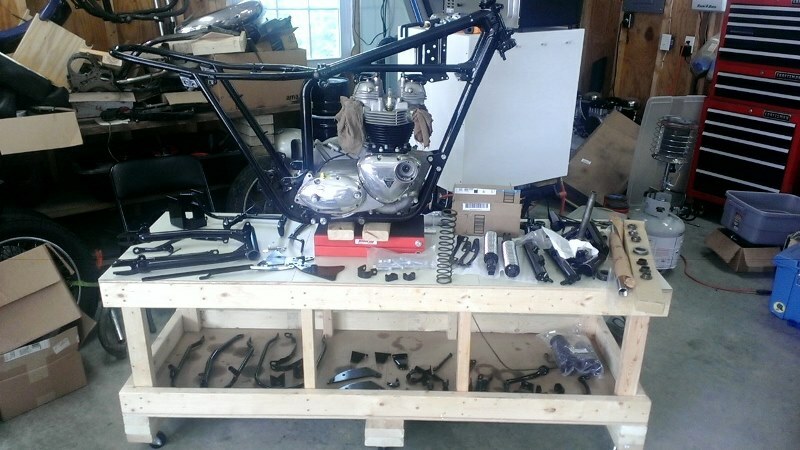 I need to get a little more done on the 74 Norton before switching to this bike because I'm completely spread-out in the shop on the Norton. November 6, 2018 Finally some real progress. The fenders are installed. The front wheel is just there to make sure that the fender stays are the right ones - they are. I found a top and front for a very good price and I found a good rear one on a shelf that I didn't remember having so I decided on chrome. The front fender above is not the one I ended up using. It's original paint NOS so I decided to hang onto it. The one I had painted was original paint as well, but in bad shape. 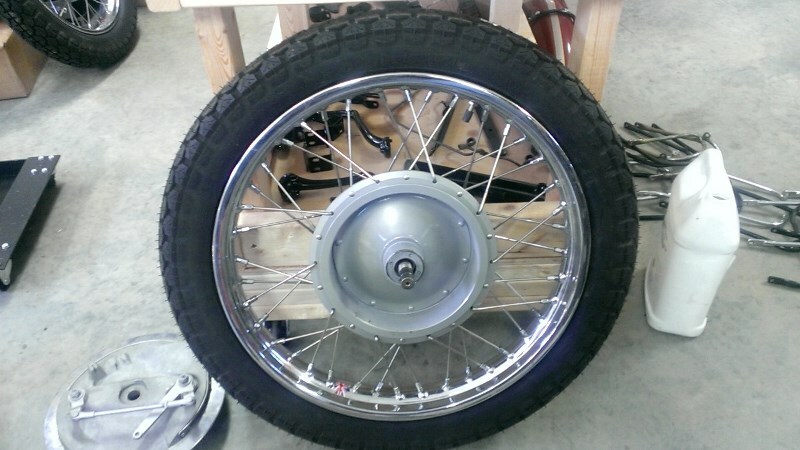 The wheels were finished long ago, but apparently the front wheel has a slow leak because the tire is soft. Also, my bad thumbs won't let me finish putting the gaiters on so I'll wait until someone stops by to help. November 10, 2018 More progress. Changed the tube in the front wheel and installed the wheel. Spent a long time figuring out the nuts for the rear wheel. All four were the same thickness so the wheels would not fit between the swingarm. The chainguard is just in place, not installed because I don't have the special bolt for the rear mount - I've got one on order. I checked with the prior owner and was told that the engine builder was good so I'll try it as is. I've got to go through my oil tanks - hopefully I have a good one I can powder coat. November 15, 2018. Found a good oil tank, cleaned it, plugged all the holes, blasted it clean, and sent it CA with a bunch of Norton sided covers to be painted. December 2, 2018. Got the chainguard installed and then realized that it was the wrong one! They were simplified in 1969/70 and I had the older type installed. So, I took it off and installed the right one. It is powder coated but has many fine scratches so I'll have to do something about that eventually. Also worked on the motor mounts today. The left side motor mount and rear brake pedal were powder coated but not masked first so I had a lot of work to get the powder coat off the pivot. Once I got that mocked up, I tried to put the right side together. It turns out that the mount is quite bent but nicely powder coated - stupid people! I searched through my parts and found an even more bent right mount. Before starting to search for one on line, I looked a few more places around my shop and found a good one. 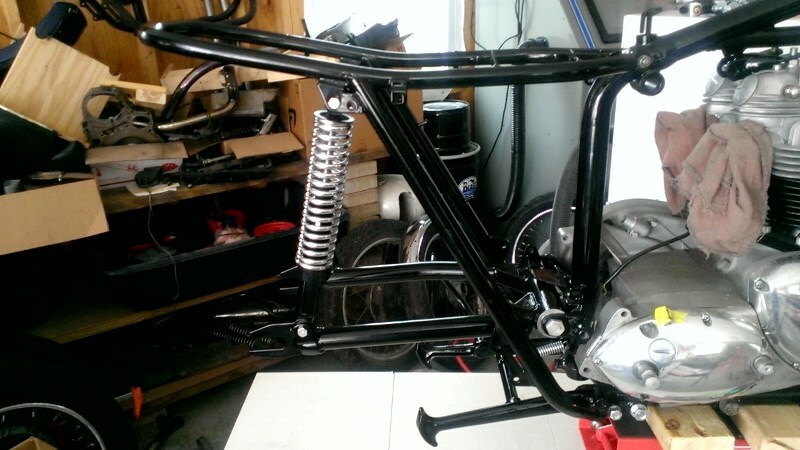 It needs blasting and powder coating. December 8, 2018. Due to an error by my cardiologist who added a new drug that was a different version of one I already take, I've been sick for a week. I finally felt good enough to do a little work today. I blasted the right motor mount and on a trial fit, realized that someone enlarged one of the holes for the two pegs that position the footrest. So, I brazed it closed and redrilled it then I powder coated the mount. That little bit of work wore me out.